A list of projects funded by the UK government in Ukraine in 2017-2018. Ukraine remains a significant priority with strategic importance for the long-term security, stability and prosperity of the European continent and for UK interests. Our support to Ukraine increased following the Maidan protests in 2013/14, when Ukrainians demanded reform and an end to corruption, followed by Russia’s illegal annexation of Crimea and instigation of the ongoing conflict in eastern Ukraine. In 2017/18, our assistance package continues to help Ukraine build an accountable and prosperous state, with a government able to make essential reforms, building its resilience to external aggression and destabilisation and supported by a united international community. This includes a range of conflict management, peace-building and recovery programmes, alongside support to reform and anti-corruption agenda, and provision of essential humanitarian aid. This package of support comes under four funding programmes: the Conflict, Stability and Security Fund (CSSF); Good Governance Fund (GGF); Bilateral Programme Fund (BPF); DFID’s Humanitarian Fund. It also includes the British Council Ukraine funding. British Council Ukraine £1 million. Budgets for each project listed below are for the duration of a project, rather than the financial year 2017/18. Ukraine’s successful transition to democracy and adherence to good governance is in the UK’s national interest. That is why the UK is supporting Ukraine’s efforts to build an accountable and prosperous state, with reformed government structures that improve the quality of services to citizens and businesses. This will contribute to the long-term security, stability and prosperity of the European continent. This project supports the staff of the Speaker’s Office to develop the skills necessary for effective implementation of parliamentary reform, focusing on a number of important areas in which a more strategic and influential Speaker’s Office has the potential to increase trust and significantly transform the accountability and efficiency of the Parliament. Ukraine’s potential for innovation and creativity is significant. But intellectual property (IP) rights need to be enforced in order for innovation to yield positive results. Therefore, this project supports the establishment of a well-functioning IP Court for Ukraine to help ensure effective enforcement of intellectual property rights, improving the investment climate for key growth and social sectors. It is expected to be implemented in parallel with a complementary GGF project to help set up and running a dedicated IP Office in Ukraine. This project provides co-funding to GIZ in support of improved public financial management in Ukraine. GIZ provides technical assistance and capacity building to key institutions in support of Ukraine’s new Public Finance Management Strategy. Good public financial management is essential to a stable economic environment, to provision of efficient and accountable public services and to help fight corruption. In 2017, UK funding focused on strengthening the capacities of financial institutions, improving the performance of oversight bodies, and building dialogue between citizens and government on the management of extractive industries. 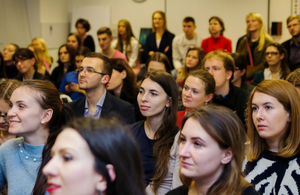 The ELECT project helps combat political corruption, strengthen Ukraine’s election administration, and inform civic engagement, including of vulnerable and minority groups. Since 2014, Ukraine has made significant progress towards meaningful electoral and political reforms. Yet continued support is necessary. The ELECT project is designed to support the country’s electoral processes and yield an effective, transparent, and participatory environment in preparation for important elections in 2019 and beyond. This project helps unlock the EIB’s loan financing by building capacity of small and medium-sized enterprises as well as financial intermediaries to identify, design and assess investment opportunities. This will improve the productivity and efficiency of the agrarian food value chain in target countries, including Ukraine, Moldova and Georgia. This assistance will be delivered through the EIB’s Eastern Partnership Technical Assistance Trust Fund. This project helps enhance women’s political participation and raises the visibility of female leaders while also increasing public awareness of gender inequality and gender stereotypes. Women who want to become politicians will benefit from leadership and campaign skills courses. The Business Ombudsman Institution (BOI) helps address corruption and unfair business practices by providing timely assistance in resolving complaints of mistreatment of businesses. Since its launch, it reports that it has successfully closed more than 2,000 investigations, and had a direct financial impact of more than EUR 350 million. The EBRD’s Ukraine Stabilisation and Sustainable Growth Multi-Donor Account has supported the BOI from its foundation. This project provides UK advisors in security sector reform to the EUAM, including on policing, judicial reform, public order and prosecutions. The EUAM in Ukraine assists the Ukrainian authorities toward sustainable reform of the civilian security sector through strategic advice and practical support for specific reform measures, based on EU standards and international principles of good governance and human rights. This project works to advance equality in Ukraine by helping to increase the diversity and inclusiveness of Ukrainian politics and society. It supports LGBTI communities through Ukrainian civil society organisations (CSOs) by conducting public information campaigns in three oblasts: Kharkiv (CSO Sphere), Kherson (Gender Z) and Zaporizhya (Inaya); and by training activists and conducting research on attitudes towards LGBTI people. This is complemented by a twin project, funded by SIDA, that covers L’viv, Odessa and Kyiv. Ukraine currently faces two battles. One is with the Kremlin, which has violated Ukraine’s territorial integrity and seeks to destabilise the country. The second battle is against corruption that drains the public purse and erodes public trust. An open, transparent and accountable Ukraine is in the interests of the UK and of our European allies. That is why the UK supports Ukraine’s efforts to eradicate corruption, including through enabling better public procurement, availability of Open Data and provision of eServices. This project supports Ukrainian citizens and the Ukrainian government in reducing or eliminating corruption in key public administration services through greater use of Open Data, supporting transparent public procurement development (e-Procurement), and development and implementation of e-Services. The UK is providing co-funding to the project with USAID. The project helps to develop key components of the e-Health system in order to prevent fraud and data falsification and ensure information security. It works in detail on a new fraud detection mechanism, two-factor authentication and system penetration testing. The e-Health system is central to the implementation of Ukraine’s health reforms, removing opportunities for corruption in health financing and contributing to more effective healthcare. The project provides technical assistance to Ukrainian anti-corruption institutions, including the National Anti-corruption Bureau of Ukraine (NABU), and enhances effective use of asset declarations in support of anti-corruption efforts. The project continues to support NGO and media monitoring of government actions, including asset declarations and conflicts of interest. The project also has flexibility to respond to anti-corruption opportunities as they arise, including in implementation of the High Anti-Corruption Court for Ukraine. The project supports Ukraine’s law enforcement agencies by strengthening their investigative capacity, including in corruption, economic crime and IT-facilitated human trafficking. This includes thematic training and access to best international practices, with a particular emphasis on UK experience. The project contributes to a more effective response to corruption and organised crime and aims, over the long term, to have a positive impact on Ukraine’s socio-economic situation. The project supports the NABU with the development of a modern human resource management strategy and capacity building, including recruitment and induction management, human resources administration and staff compliance, setting goals and objectives, staff motivation, learning, development, evaluation and retention. The project supports the NABU with enhancing information security (IS) practices according to domestic legal and regulatory requirements and leading international practices in the IS area, as well as capacity building of NABU personnel on IS matters. Ukraine’s media and information space is doubly distorted due to oligarchic control of the main channels and steady influx of disinformation and propaganda, mainly originating from Russia. Our accountability and communications projects focus on countering the destabilising effects of propaganda; ensuring the Ukrainian government is better equipped to effectively communicate its reform agenda; building the capacity of independent media outlets in Ukraine to hold power accountable and enable more informed and active citizens. This project supports the civic radio broadcaster, Hromadske Radio, to provide unbiased, factual reporting and news to the east of Ukraine (including the conflict affected areas), where access to independent media is limited and Russian disinformation is readily available. It aims to support peace-building efforts by helping establish an independent media space for people in the region to engage with decision makers and civil society. This project supports the NGO StopFake.org in its fact-checking, debunking and information verification work that aims to tackle the negative effects of disinformation and propaganda about Ukraine (within Ukraine and around the world). This work consists of two projects to help build the strategic communications capability of the Government of Ukraine, including via embedded experts within the Cabinet of Ministers and a UK advisor to the Ministry of Foreign Affairs. The focus of this work is on planning, coordination and evaluation of communications outputs, countering Russian disinformation and improving Ukraine’s communication of its reform agenda. Different aspects of this work are funded by both CSSF and GGF. This project is piloting the teaching of IREX’s proven Learn to Discern (L2D) approach to media literacy in Ukrainian secondary schools. It helps empower Ukrainian youth to better discern fact from fiction in the information space and to make informed decisions as to which information they consume, share and produce – decisions that are critical to democratic governance. The UK is co-funding the project alongside the U.S. Embassy Kyiv. This project improves the effectiveness of the National Public Broadcasting Company of Ukraine (UA:PBC), including its delivery of a digital multiplatform Newsroom. This will help UA:PBC fulfil its reform agenda and create a permanent basis for publically owned quality, objective, and unbiased news content in Ukraine. The project provides consultation and mentoring to Hromadske TV’s management and their news and programme departments to help them generate impartial and accurate news and information for Ukrainians. The project helps Hromadske TV develop its newsroom strategy and organisation, editorial standards, programme design and look, and presentation and reporting standards. The project also works on building capacity in non-news programming with a view to attracting audiences to the channel. The east of Ukraine is suffering from a conflict manufactured by Russia, which has resulted in the deaths of over 10,000 people, over 1.5 million people being displaced from their homes and roughly 8% of Ukraine’s territory being controlled by Russia-backed separatists and the Kremlin. The UK is a key partner of Ukraine, committed to supporting the Ukrainian government and its people during this ongoing conflict in the east. Through our conflict, stability and security work we are helping Ukraine to defend itself, and we are providing a range of conflict management and peace-building work to help the most vulnerable people affected by the conflict. The UK is funding demining in the parts of eastern Ukraine, affected by the military conflict. Demining is directly aimed at saving people’s lives from the large scale contamination by land and anti-personnel mines, improvised explosive devices and explosive remnants of war. In clearing land, demining also releases affected land back to local communities, supporting their socio-economic recovery. In 2017/18, HALO cleared over 400,000 m2 of previously contaminated land. HD has been working in Ukraine since December 2013 and has established a number of dialogue initiatives aimed at introducing comparative international expertise and creative ideas into the official dialogue process, and preventing further polarisation between the conflict parties and their respective constituencies. HD’s activities seek to build understanding and reduce tensions by facilitating dialogue in search of a political solution to end the conflict and ongoing related concerns, such as such as the ecological threat. This project supports institutions and organisations with a mandate to build the capacity of Ukrainian government bodies and civil society organizations (CSOs) through the provision of services to internally displaced people. In 2017/18 services (e.g. advice on housing, pensions, employment) were provided by the Liaison Officers (RADNYK) Programme, including to representatives of NGOs and CSOs. So far, over 2,000 IDPs have been supported to access state funding programmes for cancer treatment, to gain access to their pension and social rights, and to receive legal payments. NGO Forum provides financial, organisational, training and consulting support to enhance NGOs organisational capacity and sustainable development across Ukraine. To date NGO Forum’ support has enabled a number of NGOs to better refine their areas of focus and increase their organisational capacity, including in the areas of understanding conflict sensitivity, advocacy skills, information security and access to public information. This project supports the OSCE SMM by providing high quality observers and HQ staff to monitor the implementation of the Minsk Agreements. The SMM is the first of its kind to carry out such a forward leaning mission in a fully active conflict zone. The UK is currently the seconded largest seconding nation with around 60 secondees. The project works to reduce human rights violations by strengthening permanent field presence of human rights monitors in areas controlled by the armed separatist groups and under Ukraine’s control, along the contact line in the Donetsk and Luhansk regions. It helps document and share information about the human rights situation and foster partnerships between citizens and the government in addressing conflict-generating issues. This project provides expert advisory services to the Ministry of Temporarily Occupied Territories (MTOT) for activities related to peace-building and social cohesion. Core activities include the development of a Master’s degree programme in Conflict Management and Mediation. This initiative aims to professionalise the field of conflict management, mediation and resolution in Ukraine by training a new generation of professionals to meet existing conflict challenges in society and to mitigate the development of future ones. This pilot project promotes the use of dialogue as a means of community decision making and conflict resolution at two levels. At the local level, the project works in four communities in the Donbas region to establish Dialogue Initiative Groups, made up of civil society activists and local government representatives. At a national level, it works with government officials and MPs to increase awareness of dialogue approaches. The UK’s Special Defence Advisor and team provide high-level bilateral advice and assistance to the Ministry of Defence of Ukraine, the General Staff of Ukraine, and National Security and Defence Council on defence and security reform and good governance. The team work closely with a broad range of international stakeholders, including NATO, the bilateral advisory community, Transparency International and the UK Defence Academy to deliver a range of projects to support reform in areas such as defence planning, procurement, logistics and crisis management, and anti-corruption. Funding also continues UK support to multi-national (NATO) efforts in Ukraine. Operation ORBITAL was launched in February 2015 in response to a request from the Ukrainian government to provide guidance and training to the Ukrainian Armed Forces (UAF). Our training is defensive in nature, conducted away from the conflict in the east and is focused on skills for which the Ukrainians have sought our assistance. These include medical, logistics, ground sign awareness and general infantry skills. The project supports the integration of IDPs and helps stabilise host communities by stimulating business and employment opportunities in 24 regions of Ukraine. The forced migration from homes in non-government controlled areas in eastern Ukraine has had a profoundly negative impact on households’ economic status, with jobs and businesses left behind and IDPs often relocated in areas with limited employment opportunities. The project delivers self-employment grants, vocational training and business improvement consultations. A business exchange platform was set-up to share and disseminate best practices. The ongoing conflict in eastern Ukraine continues to have a devastating effect on millions of people living on both sides of the line of contact. As a distinct UK source of support in Ukraine, DFID humanitarian funding through its partners is delivering humanitarian assistance targeted to reach the most vulnerable people and help communities access essential goods and services, including food, water and shelter, as well as psychosocial support to survivors of sexual and gender-based violence and those affected by the trauma of conflict. ICRC interventions cover crucial sectors of the rehabilitation of water, sanitation and health infrastructure, the provision of medical materials, emergency food, cash assistance and household supplies for people most affected by conflict. In addition, they cover visits to places of detention, tracing of those missing and the reunification of families separated by war. As guardians of the Geneva Conventions, the ICRC also undertakes dissemination of International Humanitarian Law (IHL) to all parties of the conflict in Ukraine. DFID funding for DRC focuses on its work in the livelihoods sector in government-controlled areas (GCAs) of eastern Ukraine. DRC provides grants and training to individuals affected by conflict so they can start small businesses to have basic, self-sustainable incomes and lessen reliance on government or international support. DRC also provides legal assistance to its beneficiaries and the broader population displaced by conflict in eastern Ukraine. PIN is operational in non-government controlled Luhansk and government-controlled areas of eastern Ukraine. It conducts emergency and longer-term water and sanitation and housing repairs, provides training and grants for conflict-affected people so they can establish small businesses, rehabilitates community centres and conducts programmes to provide psycho-social support for children. UNFPA and its national implementing partners work in close cooperation with government authorities to conduct activities to prevent and respond to violence against women and girls. Through legislative advocacy and education campaigns, mobile psycho-social support teams directly supporting victims of domestic violence, operation of women’s shelters and a national hotline providing referral services, UNFPA has increased awareness and improved the response to sexual and gender-based violence (SGBV) beginning in conflict-affected parts of eastern Ukraine but gradually extended nationwide. For details of project activities funded by DFID specifically, visit this page. The UK supports human rights globally not just because it’s the right thing to do, but because a safer, more prosperous world is in the UK’s national interest. In Ukraine, we support human rights through the BPF. It includes work on increasing equality and promoting tolerance, in particular for the LGBT+ community and for people with disabilities, and strengthening human rights monitoring in Crimea, which was illegally annexed by Russia in 2014. The BPF in Ukraine also focuses on supporting decentralisation reform, which is vital to ensuring capable local government and active communities committed to furthering democracy. The cultural sector in Ukraine has seen huge growth in its vitality and activity since the 2014 “Revolution of Dignity”, yet its potential remains largely untapped with limited access for creative businesses to public funds, private investment and international networks. Ukraine’s education system is also undergoing changes after the Revolution, including reforms to tackle corruption in schools, boost academic integrity, and increase teacher development and university autonomy. The UK is funding, via the British Council, cultural and educational projects to help address these issues. The British Council utilises the UK’s experience and resources to bring about constructive collaboration, capacity building and increasing public support and understanding in the cultural and educational sectors. Implementing organisation: British Council Ukraine in partnership with the Ministry of Education and Science of Ukraine, pedagogical universities, in-service teacher training institutes, schools, Global Office, Goethe Institut, Institut Francais and Cambridge English. The British Council is supporting the Education Ministry’s New Ukrainian School reform. This includes developing a new curriculum for student English teachers at pedagogical universities and a new Professional Development Framework for teacher attestation. British Council-trained change agents are working with teacher training institutes in every oblast to ensure that 17,000 English teachers are prepared to implement the reforms, including the introduction of learning English from Grade 1 and developing 21st Century skills in children. The project focuses on improving the standards of English language teaching in 32 universities across Ukraine. Activities include training teachers of English for Specific Purposes, English for Academic Purposes and English as a Medium of Instruction and developing new English for Specific Purposes syllabi for students of different specialisms. The project has recently published extensive research to initiate a policy dialogue on the role of English in higher education. The British Council works with the Presidential Administration, Verkhovna Rada, Cabinet of Ministers and other government bodies to develop the job-related English skills of Ukrainian civil servants involved in representing Ukraine, to support Ukraine’s effective cooperation with international partners. Each year, professional English language training was provided to 500 civil servants, plus some civil society and media organisations in 2016/17, reaching more than 2,500 people. The project helps enable 600 patrol police officers deployed in central Kyiv to develop their job-related English language skills through a 140-hour English course. This forms part of capacity-building for the patrol police force to ensure that Kyiv is a safe and welcoming city for international visitors, including for the Eurovision Song Contest in 2017 and the UEFA Champions League final in 2018. Seventy-nine battalion commanders also receive English language training through the project. Implementing organisations: British Council in partnership with the Ministry of Education and Science of Ukraine. The British Council works in cooperation with the Ministry of Education and Science and the in-service teacher training institutes in the government-controlled areas of the Luhansk and Donetsk regions to support 20 schools located near the line of conflict. A Resource Centre has been established within each participating school, providing the base for an English club to involve parents and the community in after-school activities, thereby promoting social cohesion, and to act as a hub for other local schools. As part of an Eastern Partnership regional project, the British Council supports artistic collaboration between British and Ukrainian professional dancers, a Ukrainian choreographer and artists with disabilities who have previously not had the chance to work in inclusive settings. The aim of the project is to support the inclusion of disabled people in the creative economy, challenge social attitudes to disability, develop new audiences for inclusive performances and change their perception of disability arts. The British Council’s flagship capacity-building programme across all main cultural sectors in Ukraine focuses on the development of technical and business skills of local cultural operators, through programmes that enhance their internationalisation and their links with UK partners. Programmes are run in theatre, music, literature and publishing, film and the visual arts, in partnership with leading UK cultural institutions (Liverpool Biennial, Young Vic Theatre, Rockethouse, BFI, etc). This project is part of a global business skills development programme for emerging creative entrepreneurs, developed by the UK innovations agency Nesta and the British Council. Since 2015, more than 300 emerging creative entrepreneurs from all over Ukraine benefit from the programme. Training is held in eight cities (Kyiv, Lviv, Kharkiv, Odesa, Dnipro, Poltava, Rivne, Ivano-Frankivsk), hosted in creative hubs or organisations supporting local creative industries. The programme’s alumni are now forming active networks. The project develops three MOOCs (massive open online courses) on Ukrainian history, language and literature and on mathematics, which pupils of the 10th/11th grades in the temporarily occupied territories can use to prepare for Ukrainian school-leaving exams, giving them the chance to apply to Ukrainian universities and gain a valid and internationally-recognised university degree. Ukrainian is no longer taught in the temporarily occupied territories. In the first year, 70,000 learners accessed the MOOCS, including 12,800 from Donbas. The British Council and the UK sector skills agency for hospitality, People 1st, developed and delivered a volunteer ambassador programme to prepare 900 English-speaking volunteers to deliver a memorable welcome for those visiting and/or participating in the Eurovision Song Contest in Kyiv in May 2017. The programme is assisting reform in Ukraine’s higher education sector through the development of effective leadership in 40 universities across the country. Participating institutions learn how to implement innovative change within their institutions and get the chance to visit UK universities to share mutual experience. A national cohort of change agents – trained specialists ready to implement innovative changes in their universities – is being created to take the programme forward over the long-term. The Active Citizens programme facilitates social change by training and enabling individuals and groups to engage with and influence their communities. It works with young people across all of Ukraine, including those affected by the conflict in the east, to develop behaviours and skills that promote intercultural dialogue and support social cohesion and conflict resolution. Forty thousand active citizens have been trained so far, delivering more than 800 social action projects.